This article provides the instructions to configure and register BrightSign devices for Appspace. BrightSign devices are unable to update the Appspace App versions automatically. Please refer to the Update Appspace App on BrightSign section below for workarounds. DHCP Option 43 is now supported on Appspace App 1.36 and above. Ensure the device has been installed with the latest firmware (v 6.1.76 or higher). Download here: https://www.brightsign.biz/downloads/overview. A BrightSign compatible SD card/USB drive/SSD storage device. BrightSign devices with SSD storage are only compatible with Appspace App 1.33 and above, and BrightSign firmware 7.0.60 is required. Click System > Downloads from the Appspace Menu navigation bar, and download the Appspace App for BrightSign client (autorun.zip). Copy the autorun.zip file to a SSD storage, SD card or a USB drive according to your preference. If using SD card or USB drive, plug in the devices into the BrightSign device. The Appspace App installation package will be automatically extracted to the storage device. The autorun.zip file is automatically deleted from the storage device after the extraction. Connect the BrightSign device to a display screen. Ensure network connectivity is active, and switch on the BrightSign device. Wait for the device to boot-up and display the Device registration page. The BrightSign device may need to be restarted a couple of times if the device registration page does not show up. If using an SSD, once the initial installation and registration process is complete, you may remove the SD card or USB drive, as the Appspace App will operate solely from the SSD storage hereafter. 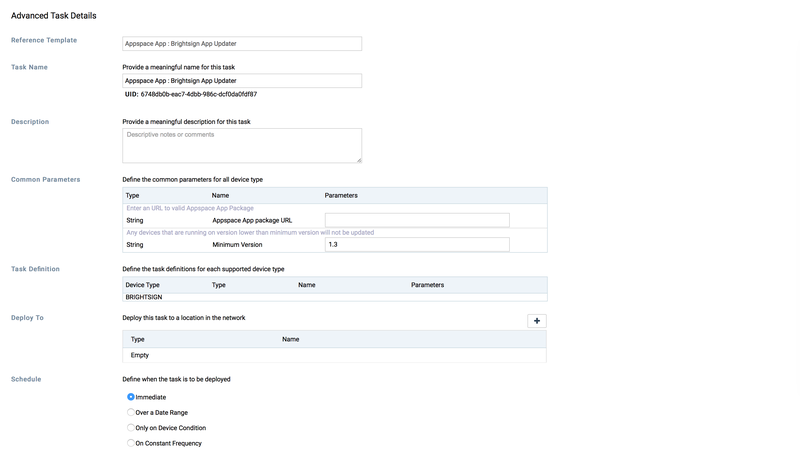 In the Configure Advanced Registration window, select BrightSign Package for the Deployment Method drop-down menu. Additionally you can configure fields such as DHCP, NTP server, Timezone, and Proxy Server. You can also perform custom scripting in the Script Configuration section. Click Download Autorun.zip to download the autorun.zip file. Save the autorun.zip file to a SSD storage, SD card or a USB drive according to your preference. If using SD card or USB drive, plug in the devices into the BrightSign device. Ensure network connectivity is active, and switch on the BrightSign device. Wait for the BrightSign device to boot-up. The Appspace App will begin registering the device, and the selected channel will be displayed. Typically, we download and store the autorun.zip file that contains a policy file on a SSD or SD card and manually register each device. 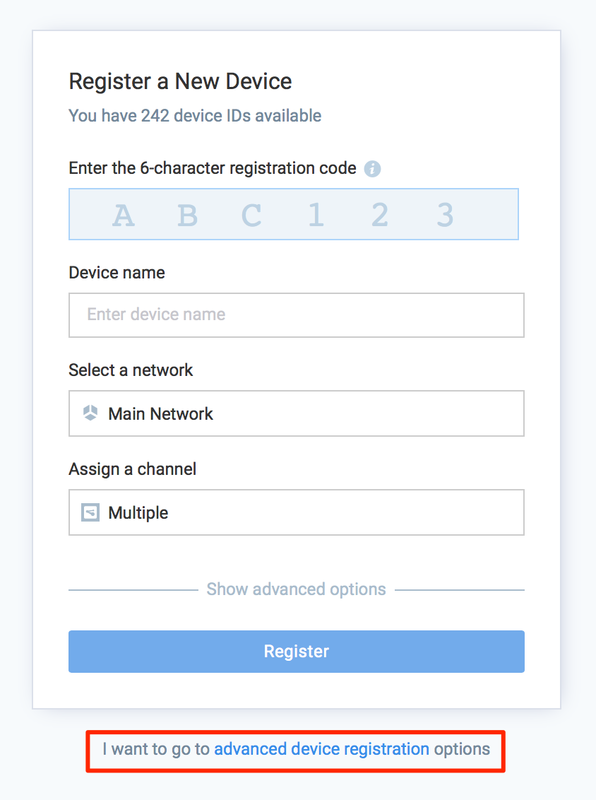 If you have DHCP Option 43 enabled on your network, you can now leverage this option to allow all devices plugged in to the network, to auto-register the devices and begin playing the assigned channels, without user intervention via a provisioning script. A DHCP server on the local network configured with DHCP Option 43. A provisioning server to handle the recovery request from the device. A provisioning script that will download the autorun.zip file and reboot the device. For help configuring the above scripts and server, please contact BrightSign. Follow steps 1-4 in the Configure BrightSign with Local Policy File section above to configure the policy file. Click Download to download the autorun.zip file. Place the autorun.zip file on any desired web server. Define the URL path to the autorun.zip file in your provisioning script. Ensure network connectivity is active, and switch on the BrightSign device. Once the device boots-up, the device will automatically install, and register the Appspace App. The BrightSign device will restart a couple of times to complete this process. Assign channel to each device. Assign default channel to a network. This is applicable to Appspace App version 1.13 and above. To ensure the Appspace App is automatically updated on all supported BrightSign devices, follow the instructions below to update your Appspace App. Navigate to Admin > Networks, and set the Software.SoftwareUpdates player property value to TRUE. For instructions on how to add these player properties in the Appspace console, please refer to Managing device properties article. Navigate to System > Downloads in your Appspace Cloud account, and download the latest Appspace App for BrightSign package, and save it to a hosted folder. Navigate to Admin > Device Tasks in the Appspace menu. Select the Advanced Tasks tab, and add the Appspace App : Brightsign App Updater task. 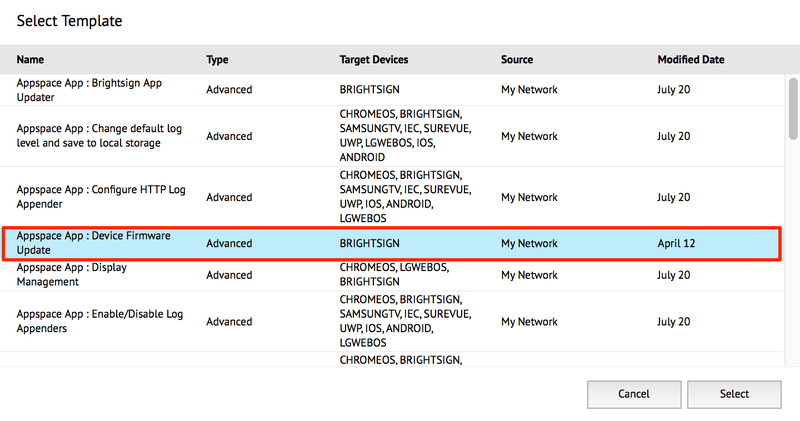 Configure the task and deploy to your desired network where the BrightSign devices are registered. Extract the BrightSign firmware .zip file. Copy only the .bsfw file and paste it in a folder on the local web server. Right-click and compress the .bsfw file. On the Appspace console, navigate to Admin > Device Tasks, and click the Advanced Tasks tab. Click the Add button, and select the Appspace App : Device Firmware Update task. In the Common Parameters section, enter in the URL to the BrightSign firmware package on your local web server (from Step 3 above). In the Deploy To section, select the desired network to deploy the task to. In the Schedule section, select the desired deployment option. To enable text overlay over video for viewing in interactive mode (user mode on a web browser or mobile device), you will need to add a device property, while to enable it on a sign channel, you will need to add a widget property to the Media Zone widget instead. 0: Disables “hwz” mode completely. 1: Places the video in front of all graphics (the default setting). 2: Places the video in front of all graphics, as well as a second video element. For instruction to add a device property, please refer to Adding New Device Properties. For instruction to add a widget property, please refer to Adding Widget Property. Change the Sign channel layout Background Color to #010203, and set the Opacity slider value between 1 and 100 (non-zero value). In Appspace 7.0, a single playlist channel automatically rotates based on the natural orientation of the device. However, BrightSign does not by default have a device orientation setting to support this feature, and instead follows the current, or last orientation setting of a device. To display in Landscape, configure the Display.Rotation with a value of 0. To display in Portrait, configure the Display.Rotation with a value of 90.